When you travel enough, you start to appreciate the uniqueness of certain airports. If you travel a lot you REALLY start to appreciate what the different amenities that individual airports can offer. 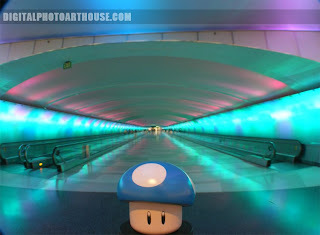 Not saying it won't happen but never once has the Traveling Mushroom experienced an issue at DTW. One issue one might have is the extreme size of the airport. There is a tram service that will take you from one end to the other but a foot race has been done and it isn't always the fastest mode of transportation. If one finds they have enough time to wonder in this modern airport, it is recommended to find the underground tunnel connecting the two terminals. The artistically designed lighting system is something you wont find in any other airport in the United States. It can help to bring any kind of calm (if only a small amount) to the stress that traveling can bring.